This is the content I wrote just for fun 10 years ago. 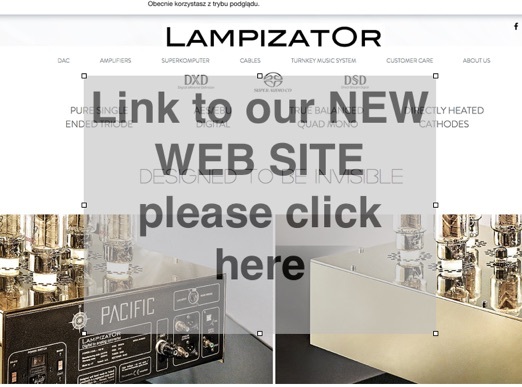 This private site LAMPIZATOR is dedicated to tube DIY, music, and practical ways to best sound reproduction. This site hasn't been updated since 2010 and it is considered archive only. Since I can't afford a dream system, I decided to learn what makes this technology "tick" and to build the system myself. Soon the pursuit of hi-fi truth became my passion and I relentlessly look inside the boxes, in vain hope to find honestly made and good sounding products. If we can buy it - thats fine. If we can't - we must do it with our own hands. It is a combination of buying used gear on eBay, modifying, mixing and matching, and having open ears to new gems from China. In fact - it is easy. I think I have found all elements I need: best source - CD player with Lampizator, best amplifiers (tubed of course) , and best speakers (alnico). In my subjective opinion my current system can easily be called one of the best stereo systems in the World. This page is about sharing with others my experience acquired in the process. I am trying to condemn marketing and engineering B/S which I find inside gear. I am a self proclaimed Prometheus. I steal the industry secrets and give them back to the people. I ridicule the ridiculous. I also easily offend the easily offend-able. My approach is to achieve best sound regardless of the cost, but fortunately my discovery is that it is not the money that make the sound, but intelligent choices. This page is not a "poor man's Hi-Fi", it is about best hi-fi period. of this experience in my DOC called LAMPIZATOR 2.0 which was released in July 2008. My search for the best sound from 50 dollar eBay equipment like old Philips CD players and cheap Chinese amps is documented in these pages - over 7 years of every day writing and countless experiments. My goal was to own "the best stereo system in the World" and to do it on a reasonable budget. The second aim is to share with others what I have found out in the process, i.e the Lampizator, The Saba speakers, the gem DAC's and Russian super-tubes.